You are here: Home › Why is Thermal Storage Essential for Pellet Boilers? Your home’s heating system was designed to keep you comfortable on the theoretical coldest day of the year in your geographic region. The largest contributing factor for your design day is the difference in temperature between the inside and outside of your house; this is referred to as the “Delta T” value. A typical Delta T for the Northeast is 78-degrees, representing a day that is -10º F outside and comfortable 68º F inside the house. On those days your heating system will get up to temperature and run nearly non-stop—that is the most efficient use of the system and the fuel. Each year the coldest days are only a fraction of the total days that your heating system operates. The rest of the time the heating zones around your home go on and off based on different temperatures around your house, thermostat settings, and calls for hot water if your domestic hot water maker is tied into your heating system—a popular and efficient arrangement. When a zone turns on, it forces the boiler to come on to provide heat to the area that has dropped in temperature. Most homes have several zones, none of which are typically large enough to dissipate the full output of your boiler. The result is that the boiler hits a high set point temperature (typically around 180º F) and starts to modulate its output lower and lower to match what the zone can absorb in heat. Most of the time, this results in the boiler having to shut down, only to have to restart again immediately as the Zones continue to call for heat. That’s called “short cycling” and it is not a desirable condition. In recent studies by the Brookhaven National Laboratory (performed for the US Department of Energy) it was found that the average pellet boiler runs 60% of the year at 20% or less of its full output; that’s a lot of short cycling. Why is Short Cycling bad? The condition of Short Cycling consumes about 15% more fuel, how does that change the calculus of your equipment capitalization over decades of use? The additional fuel is a result of the increased number of start-stop cycles the boiler is forced to run through; and this also increases the emissions of the boiler. 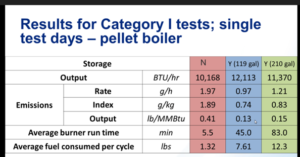 Short cycling your pellet boiler without thermal storage produces three (3) to ten (10) times more particulate emissions than running at a constant output. Besides cleanliness and efficiency, Short Cycling takes a toll on the mechanical and electrical components of your system. Short Cycling forces multiple, unnecessarily uses of system components, and in turn will lead to a shorter life of your pellet boiler investment. The solution is to store enough stand-by thermal energy, in the form of hot water, so that many calls for heat around your house will be satisfied while the boiler only runs once. This is particularly important during the shoulder season and the majority of the heating days that are not as cold as your Design Day. 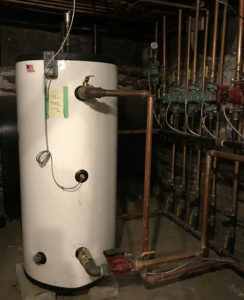 Thermal Storage connected to your system is typically accomplished through the installation of hundreds of gallons of water, located in heavily insulated tanks, connected to the boiler and your heating system. The boiler serves to heat this large thermal mass of water and in turn the water is used to heat the house. The boiler is only turned on when the water in the thermal storage tanks falls. When the boiler comes on to heat the tanks, it can run for an extended period of time and at a very efficient and clean burning high rate as it is heating a large thermal mass as opposed to only one or two small spaces within your house. Is Thermal Storage the Only Solution? The only time you wouldn’t need thermal hot water storage is if your system was designed to store that heat somewhere else. For example, a high-mass radiant floor system in concrete or a converted steam system that has hundreds of gallons of hot water and a high thermal mass of cast iron in the heating distribution loop and radiators. So, thermal storage is one solution. The other is that your entire heating system may only have a single, large, high-mass zone that can absorb and dissipate the full output of the boiler over a long period of time. As soon as you add a smaller, lower thermal mass zone you’re back to multiple calls for heat, short cycling, and the need for a thermal storage tank. So How Come Some Installers are Telling me that their System Doesn’t Require Heat Storage? Most, if not all current model pellet boilers “modulate,” meaning they sense and react to water temperature in the system and thermal output of the radiation connected to the boiler (those radiators, fan coils and radiant floor systems heating your home). For most systems, the boiler adjusts its output and lowers its firing rate down to 30% of its full firing rate. The problem is that the research, science, and practice prove that this is still not low enough for over 60% of the heating season. All boilers CAN be run without thermal storage, but doing so WILL sacrifice performance. Some companies have decided that their best business model is to sacrifice clean emissions and fuel savings in order to lower the initial cost of installation by eliminating the cost of thermal storage. We think that’s short-sighted. When you factor in the increased fuel use, increased emissions, unnecessary cycling, and wear and tear it’s more than sufficient to justify the relatively small added up-front cost of thermal storage. Just making sure you didn’t miss the point that running any pellet boiler without hot water storage produces three to ten times more particulate emissions (see for yourself in the published EPA test Data reported by every manufacturer here: EPA Approved Wood Hydronic Heaters). Now that we finally have the cleanest technology in the history of heating, Pellergy feels strongly that we owe it to future generations not to cut corners. Pellergy is committed to being the leader in clean heat, we believe in physics and we recommend thermal storage with every wood pellet boiler installation.